Networking with Families: Massive effort to discover the whereabouts and plight of members of the Jewish community. Communication centers to aid distraught evacuees in neighboring cities in Texas, Arkansas, Tennessee, Alabama and Florida. Recovery, Healing and Renewal: Relief Corps. Employment. Schooling. Special Services. Chabad has provided, and continues to provide, needed assistance to hundreds of Jewish families and individuals diplaced by the storm. 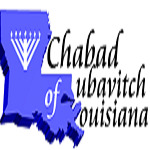 We have also begun the laborious process of repairing the Chabad institutions in New Orleans, and restoring the New Orleans Jewish community. Among those victimized and displaced are some 12,000 Jews from the city of New Orleans, as well as Jewish inhabitants from cities and parishes in neighboring Mississippi and Alabama. We appeal to you to recognize the scope of this disaster and open your heart — and extend a very giving and benevolent hand — to help alleviate the suffering of many thousands of our brothers and sisters. Click here to Donate Now.